May 16  Back to Internet, Showers, and Mountain Gossip! This call is coming from Namche, we made it back to Namche, at least the trekking group has, and it is a sad day, an exciting day but sad one. At Pangboche we said our farewell and gave our best wishes to Brad, Shelley and Ang Temba who are off to climb Island peak, those guys are going to do great. The rest of the trekking group has made it down to Namche; Dan actually left last night, spent a night in Tangboche with Nima, in our favourite lodge there. The entire group is now reunited in our lodge in Namche, of course Namche is always about yaks, trail dust and sore muscles but it is also about rooms with showers, internet, and a lot of excitement with various people coming from all the directions and joining together and telling stories, so it is a great place to be right now; we are all felling satisfied and happy to be down here. The Khumbu is still small; our climbing team is heading up tomorrow from Pangboche to the Island Peak climb. I stayed in Pangboche behind the others after they started for Namche; preparing for the climb with Shelley, Ang Temba and Brad. Nima, our famous Sherpa from previous Berg Adventures trips, was with me. Last year he had told Leila and I that he would like to become a climbing sherpa; it was interesting to see him very proudly showing Shelley all the new knots he had learned at the climbing school as well as his techniques, which were very correct and he had all the right equipment. Nima is still trekking with us but we are pleased to see how he is learning some climbing skills which no doubt he will be using with Berg Adventures in the future. The other climbers are off for Island Peak and as I said earlier, we are down in Namche enjoying the amenities and civilization down here. 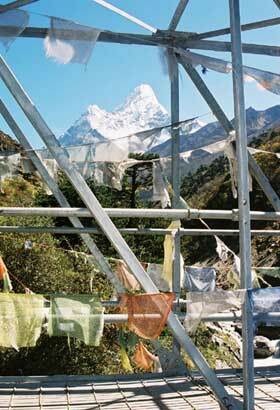 It is great to be down here and we will keep you posted on our plans as we continue to descend the Khumbu.